Not THAT Pine Valley…I wish. This one is located in Southington and is far from it. Measuring only 6300yds, Pine Valley has two distinct nines. The front nine is very hilly, while the back is more wide open with water hazards.The course has a similar feel to Hawks Landing; probably cause of its close proximity. I think the first couple holes are very simple yet nice; tree lined fairways, couple bunkers and decent sized greens. I would layup on hole 6 as you can’t reach the green so why bring the water into play? Hole 9 carries a 2 handicap and has a very wide skinny green that requires you to club up or down 2 depending on where your tee shot landed. The back nine starts off with a fairly long par 3 but it’s huge green is tough to miss. Hole 11 runs parallel with the street which is obviously OB so best bet is to layup with a long iron or 3 wood. Next up is a very tough stretch of 3 holes. First up is # 12 which is a long dog leg left that feels pretty narrow at times. #13 is the hardest hole here as its measures 442 is a dogleg right with a stream at the bend. The second shot will be longer than you think. Speaking of second shots, the second shot on 14 needs to be dead on as the green is narrow, there is water short, a hazard long, and OB right. 15 has the largest bunker I have ever seen. Looks more like a sandy waste area found in Arizona. Pine Valley gets a 7.5 on a good day. The Orchards aka MCC- Milford Country Club is located in my hometown Milford. It is a short 9 hole course with a couple par 4s but most are reachable or are 90 degree doglegs that require 2 to get home. One hole worth talking about is #4. I wish they would get rid of the large tree right in the middle of the fairway. They should cover the trunk in chocolate and have the world’s largest ground hog, usually found on that tee box, chew it down. The people that play here are very laid back so don’t expect a quick round on the weekends or in the mornings. To help speed up play, on the long par 3s and the 4s they encourage the group in front to call on the next group once they get onto the green. There are signs reminding players of that. Overall MCC gets just a 6 at best but it holds a special little place in my heart with it character and availability so I will continue to visit it often to work on my short game. I consider Orange Hills my HOME course. It was the first course I played 3 years ago and is the course I rushed to after work many a days from the train station. This course is as family run as it gets; the whole Smith family takes pride in their course including “Bud” himself who has watched over the course for the pasty 50+ years. You will also get the family feel on the first green where there are sculptures of the family dogs. Hole 1, which I eagled, is straight away and if you let it get away right you have two fairways wide in play still. #2 is a decent length par 5 with a stream running through that can swallow up your drive. Best bet is to lay up with your tee shot. It is risk/reward so if you have wind at your back go for it and you can get there in 2 and eagle it like me. Next up is a par 3 with an uphill sloping green. Following that is a slight dogleg right long par 4. This hole is very tough and if you slice your drive at all your ball will not be found. I suggest aiming for the last bunker on the left. The fifth hole is the easiest hole here so let it rip and you will have a short wedge in. #6 is a dog leg left that requires a 230y tee shot to stay left and you will still have a mid iron in. Now its time to take on the hardest hole here. This is a long par 4 that bends left but the fairway slopes hard right; good luck. Closing out the front is a short par 4 and a par 3 who’s green slopes more than it looks to the right. Now for the back nine. Starts off with a long downhill 3, don’t take too much club here as there is water long and right. If you fade your drive you should be able to score on the par 5 11th(eagled this one too). #12 and 13’s greens are protected by a pond so don’t be short. I am not a huge fan of the 90 degree dog leg right #14 but make sure you get it around that corner or else its a par 5. Tip- you need about 210 to get around the corner from the back tees. If you pure your drive on the next hole you will be left with a wedge in to a somewhat volcano green. Remember that big hill you went down on 10, now its time to go up it on 16. This is the toughest green here as it rolls fast back down the hill and right. You are not in the clear yet. #17 has a very sloped fairway so if you fade your drive I suggest you aim off the fairway left or else your ball may find the OB. The closing hole here usually leaves you with a smile on your face. It is barely longer than #17 but is a par 5(eagled this guy too…wish they were all the same round). Note- there are not too many yardage markers here but there are small bushes on every hole 150 out if you don’t have your rangefinder. Last Summer they added the one thing I thought they were missing all this time….a cart girl. And they didn’t just get any girl, this blonde was gorgeous with a beautiful smile and we all hope shes back again this yr. Overall it gets an 8+ and is a very fun, friendly place to visit. 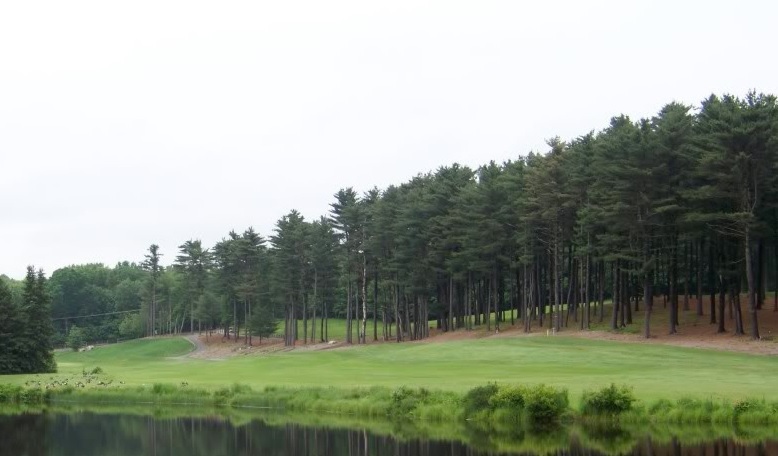 Pequabuck is a beautiful, semi private 18 hole course located in Terryville CT, which is just minutes away from the ESPN headquarters in Bristol. Noted for years as the “working” man’s club, they have a great history section on their site as well a great description that I will borrow -“Built over 100 years ago, Pequabuck is routed through a mature pine forest, the Bristol Reservoir, and railroad tracks. The course is immaculately groomed and features firm fairways with lighting fast greens” The front is nice but the back 9 is my favorite. Starts off with a long par 3 who’s fairway/green sits floating in the Bristol reservoir. Looks alone, #11 is my favorite hole in the state. The right side is lined with monstrous pines that remind me of Pinehurst, and the left side runs the length of the beautiful reservoir. Another cool hole here is the downhill par 3 16th. The thought of an old train track running through it would sound like an eye soar but to me it adds a little character. I had the pleasure of playing this track with an ESPN soccer anchor who was great company. Only thing better would have been pairing up with Buccigross! The club house could use a makeover but this course is not about the glitz and glamour. Overall it gets a 9 from me which is very generous. Miner Hills is a short 9 hole course right along side of I-91 in Middletown. Its a real tight par 3 course with 3 par 4s all under 300yds. The course is overall in just decent shape and is ideal for after work league play when thats all you got time for. They also have a little range so may be a good place to join for beginner golfers looking to improve their game. Minnechaug is operated by MDM so as you would expect, it is in terrible shape. Its a nine hole course in Manchester which serves as a warm up spot to Manchester country club at best. The holes line a somewhat new housing development. I suspect that the builder used the course to jack the price of the condos then put no money into it after he made his money on house sales. I could only imagine how many people that live on that course actually belong to Manchester though. So like I said the holes go out and around with only holes 4 and 5 touching fairways. Hole 7 is a really “unfun” sharp right turn. If you are walking, the stretch from 7 to 8 is longgg and takes you through part of the neighborhood. Their claim to fame is the island green par 3 8th. While yes it is an island green, the green itself is in toughhh shape. Never mind all the goose crap on it, there are actual geese themselves on it and most of the green is dead from that and flooding. Overall it gets a 5 from me. Lyman Orchards is probably my favorite golf facility in the state and it got even better this past year with the addition of the Apple nine and the new grass driving range. Now totaling 45 holes, the facility is made up of an 18 designed by Robert Trent Jones, another 18 designed by Gary Player, a nine hole course and TWO driving ranges. The original range plays dramatically downhill and is great to just warm up on. If you want to play for big bucks that day I suggest you hit the grass range by the Apple and then maybe even walk the apple quick. I am not going to take you through every hole here as there are too many but I will mention my favorite holes on both. Big fan of #14 on the Player with the big red barn on your left and then a very “New England” style house looking onto the green, but #15 on both courses are my favorites. People tend to think that the Jones course is far superior but I think they are closer to equals. The Player course has a lot more hills but it also has the best view on the course( tee box on # 11). Overall it gets an 8+ and is a great place to host a tournament or bring the family and enjoy all of what Lyman has to offer(apple and other fruit picking, pumpkin picking, corn maze, and a fresh produce shop). If i lived closer I would sign up for a lifetime membership here.